Transactional advertising network provider Adgregate Markets, a finalist at the 2008 TechCrunch50 conference, is extending its e-commerce technology to Facebook today, with the launch of ShopFans, a social shopping applications. 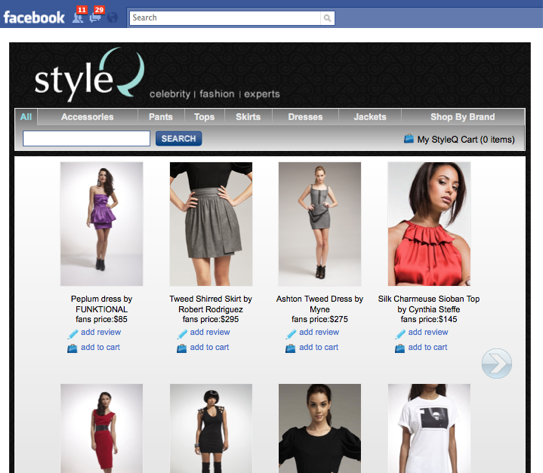 ShopFans is an e-commerce application on Facebook that allows retailers to set up a storefront on the social network. Similar to Payvment, the app allows consumers to purchase goods and make secure purchase transactions directly in Facebook. ShopFans also allows brands to to leverage Facebook’s social streams , including the ability for consumers to post News Feed stories promoting “Wish lists”, “I want this!”, “Likes”, “Shout outs”, gift registries, private and exclusive sales, and more. The idea is that the application is not only able to sell goods on Facebook but is also able to add a social element to shopping. And users can promote and share the brand’s message and products on Facebook, creating a viral advertising channel. Shoppers can share product ‘Likes’, share recent purchases with friends, rate and review products, register ‘wish lists’ and ‘gift registries,’ and receive “fan-only” special promotional deals from ShopFans’ storefront’s sales. Adgregate’s mobile commerce and advertising offerings have gained considerable traction since it’s launch a few years ago. Adgregate just launched ShopAds, which enables customers to shop and complete secure transactions within Flash-based ad banners. the startup struck a deal with NBC Universal, recently acquiring widget business Gydget and scoring a deal with distribution deal with Google’s DoubleClick, enabling advertisers on that platform to integrate ShopAds widgets with just a few mouse-clicks. The startup also recently launched its own shopping cart platform, ShopCloud.